Scientists are hoping to pick up a signal to tell them the missing British-built spacecraft Beagle 2 has arrived safely on Mars. The £35m probe should have landed at 0254 GMT on Christmas Day after a 400 million kilometre, six-month flight. On Thursday night, the giant Jodrell Bank radio telescope, in Cheshire, UK, will listen for signals between 2200 and 0030 GMT. Hopes for Beagle 2 will fade if nothing is heard by Friday night. The US space agency's (Nasa) Mars Odyssey orbiter flew over its landing site earlier on Christmas Day but failed to detect the expected message - a nine-note tune composed by the pop group Blur. If the Jodrell Bank telescope fails to find Beagle, the Nasa craft will have a daily chance to pick up a signal until 3 January, when Europe's Mars Express craft - the mother ship now orbiting the planet - begins its mission. Beagle 2 must recharge its batteries on the day it lands or it will not survive the first night on Mars. But Professor Colin Pillinger, Beagle's lead scientist, told reporters at the Open University's offices in north London he would carry on searching into January if necessary. "This is a very very tiny spacecraft and to get communication straight away was not going to be straightforward," he said. Beagle is on Mars but not where expected. Its lid and antenna are pointed in the wrong direction. A computer glitch after landing has affected the timing for switching on the transmitter. There is a mismatch between the communications system of Mars Odyssey and Beagle. Something has failed during entry, descent or landing. The worst case scenario is that the ship has crashed and is lying in bits across the Martian surface. But the historical chances of success for the mission are low. Despite more than 30 missions launched to the Red Planet since the 1960s, only three landers have ever reached the Martian surface successfully. Whilst much of the focus has been on the missing Beagle, the European Space Agency (Esa) can be pleased that Mars Express has entered an orbit around the Red Planet correctly. A late, 37-minute burn of its engine - at about the same time as Beagle was plunging through the Martian atmosphere - gave the mothership just enough velocity to be captured in the planet's gravity field. In the course of the coming week, the orbit of Mars Express will be gradually adjusted in order to prepare for its scientific mission. "The arrival of Mars Express is a great success for Europe and for the international science community. Now, we are just waiting for a signal from Beagle 2 to make this Christmas the best we could hope for," said David Southwood, head of Esa's science directorate. "With Mars Express, we have a very powerful observatory in orbit around Mars and we look forward to receiving its first results." 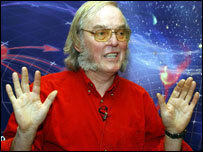 Dig the bodacious Mutton Chops on Prof. Pillinger. He looks like an Austin Powers character. It is a beagle. It will do what all beagles do, follow its nose wherever it will take it. The Prof looks like Goldmember!! The Face on Mars ate it. Originally Posted By DzlBenz: [img]http://newsimg.bbc.co.uk/media/images/39674000/jpg/_39674361_pillinger203.jpg [/img] I'm from Holland--Izzn't zat wweird? Would you like a smoke and a pancake? No? Pipe and a crepe? No? Flapjack and a cigarette? No? Cigar and a waffle? No? A bong and a blintz? No? Then there ist no pleeeeeasink you!